Welcome to Constitution Street in Leith. Maybe you know it. Maybe you don’t. You will certainly know another street well, perhaps the street where you live or work. In the decade that I lived and worked here, Constitution Street has undergone rapid socioeconomic change. During the last year, I have been documenting this change set against the broader context of constitutional crisis in Scotland and the UK in order to write a love letter to the street I call home. Human beings are storytellers at heart. And a street’s residents, its neighbours, are the narrators of a succession of stories telling of the past and reimagining the future. We have heard a lot of late on this street and streets up and down the land about our differences. The Yes and the No. The Leave and the Remain. The them and the us. Binary positions. Some neighbours displayed posters in their windows. Others closed the curtains. Some sang protest songs and wrote plays. Some felt anxious. Some felt excited. It is now time for new conversations and new ways of considering the distribution of power, land and decision-making, because if we don’t tell our own stories, others will do it for us. If Constitution Street sounds a revolutionary sort of a place it’s because it is. Or it once was, what with a name like Constitution Street, built in the late eighteenth century amidst the Scottish Enlightenment and the birth of new nations. As you may know though, the UK doesn’t’t have a written constitution. Rather, there are constitutional conventions based on case law and principle developed over centuries. There is an ongoing debate amongst legal scholars and activists about whether or not now is the moment to write a new constitution to better safeguard against excessive executive power, particularly in light of Brexit and the particular threat that Brexit poses to economic, social and cultural rights such as workers’ rights and environmental protections. Much as a street belongs equally to all the individual neighbours who call it home, human rights belong to us all. Rights are universal, indivisible and interdependent upon one another. Indeed, the preamble to the Universal Declaration of Human Rights famously states that human rights begin in the small places closest to home. Few human rights, however, are absolute. Rather, they are subject to limitations and derogations, both legal and political in nature and the most sensitive of balances embedded in human rights law is the relationship between the individual and the community. My community on Constitution Street is rich with the retelling of old stories. Key constitutional characters from history have walk-on parts, including Robert the Bruce, Henry VIII, Mary Queen of Scots and Oliver Cromwell. I think it is a special street but it is in fact much like any street. It is a place where we go about the routine of our day to day lives as we always have done. Streets, like stories, have a beginning, middle and an end. By convention, which is after all the constitutional, principled way of doing things, we should start at the beginning with a welcome because storytelling is about hospitality- the giving and receiving of life experience. So, make yourself at home. The street stretches east to west for half a mile, from the entrance to the North Sea at its Port to the beginning of Edinburgh city centre on Leith Walk. The mix of Victorian tenements and high-rise tower block, to the industrial docks, warehouses and medieval churches, embody the constantly shifting dualities of old and new in Scotland’s capital city and the waves of immigration and emigration that continue to blend culture, language and perspective. Here is a liminal land on the cusp of change in our age of anxiety. We have the best and the worst of times here. In this dynamic, fizzing space ideas bubble, ferment and rise or fall. Just like the grain imported to Leith Docks that becomes the flour that was once traded inside the Leith Corn Exchange or brewed with yeast and hops inside the whisky bonds, we are constantly warming and fermenting our stories and our sense of place in the world, preparing to prove ourselves ready. Ready for change. And how to develop empathy? You must think yourself into the story. I am interviewing the residents of this, one street in one city, here and now. I am listening to my neighbours who voted differently from me in the constitutional choices posed by recent referenda. I am challenging my own assumptions and prejudices, to consider what rights, if any, we would want to enshrine in a new constitution. And I am being surprised by known and strange things right outside my doorstep. 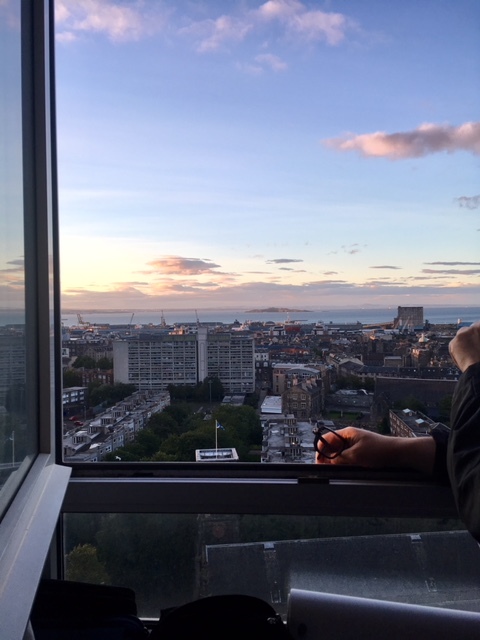 I have heard from Maddie aged twelve as she prepares to transition to secondary school, from JP on the 16th floor of Kirkgate House in the light of uncomfortable home truths about housing inequality, from Mary on the last night of the Port of Leith bar where she was the landlady, from a Buddhist nun meditating inside the former Bank of Leith, and from the First Minister in the same car park where an alligator was found inside the boot of a Vauxhall Corsa. This is our Constitution Street. You will likely also live together with your own neighbours in a form of social contract, a living constitution. If you don’t, start that conversation. My conversations have so far taken me from the Foot of the Walk in Leith, to Aristotelous Square in Thessaloniki and Placa Catalunya in Barcelona- meeting with ordinary people living through extraordinary constitutional times in their own small places closest to home. Mostly though, I walk up and down Constitution Street every day and I pay attention to change so that I might come to name it, and therefore to know it, and myself, better. In this way, I am setting out on a constitutional. Hear me to the end of the road. And at the other end of Leith from Constitution Street there is a Union Street, yet for Scotland neither any constitution nor any union exists, the latter being shown to be a meaningless charade through Scotland’s democratic majorities for indyref2 and against brexit being disregarded by our ‘administrative power’ at Westminster. No voters in 2014 gave away Scotland’s sovereignty for what we have in colonial Scotland today, namely: an enforced brexit, enforced austerity, and enforced Tory rule, and the certainties that go with it, like the continued exploitation and neglect of a still mostly derelict and obsolete Victorian seaport such is Leith Docks, with its damned stank river, now owned and self-regulated by offshore Cayman island bankers and their borrowed money from who knows where. No voters have a lot to answer for, not least for giving Scotland away to England’s Tories and their rapacious offshore banker friends to do with as they please. You are so right Alf. Heartbreaking. Jemma, I totally love what you’re doing in and for Constitution Street. The pace of change in Leith has been accelerating over the last couple of years. A lot of it counter to the interests of working class Leithers. Your project is so timely and will be a special historic record. Curious to know what you’ll do long term with everything you find and accumulate. Offshore banker/fund ownership of the immense yet now derelict and obsolete Leith port estate is certainly “counter to the interests of working class Leithers” or to the needs of society generally. Hundreds of acres of derelict dockland could provide for 20,000+ houses within the city, which makes the docks the largest single undeveloped land bank in Edinburgh; yet instead the speculator owners do nothing with it, and meantime housing pressure is put on the green belt around Dalkeith, Musselburgh, Pans etc where landowners/builders are coining it in with overpriced dwellings. Things could be so different. Surely the council could consider compulsory purchase of the port land, much of which remains neglected and unused, and useless for modern shipping, land which anyway was given away (aka ‘privatised’) for next to nothing in 1991 by Tory (Sir) Malcolm Rifkind, Mrs. Thatcher’s then Transport Minister. An opportunity with this to finally flush out the silted up stagnant river again; draining the swamp in more ways than one. Lovely writing Jemma, intrigued to learn more. We do live in curious times, I think your search to name these times is shared by many, future historians will give it a name. I certainly play around with what that name might be.